Although the road was called up to the incorporation of the village to the city of Karlsruhe peace road, they were called but only "'s Gässle". This old designation Picking up, she was given at that time the name "In Gässle". For a long time it formed above the Pfinz the eastern end of the village. At its confluence with the Friedrichstraße, a gate was to the distant past meadows. Many geese were kept out here that have been driven even the beginning of the 20th century nightly from a small Gänseliesel home. As can be seen in the painting Friedrich Kallmorgen, it was here in the street, as in most streets of the village, an open wells. That here, just before the small deflection, was used by the farmers and geese Lieseln consumed by the animals and of the maids for domestic supply. Already at the end of the 19th century, the community was anxious to put a water line for the individual houses, but there have been delays. Many of the own resources were not productive enough or were too far away, so that the necessary lines would become too expensive. 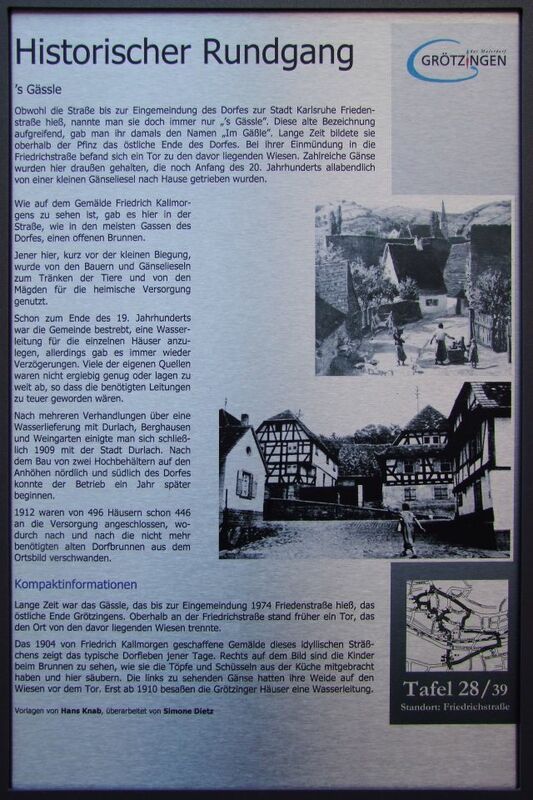 After several negotiations on a water supply with Durlach, Bergshausen and Weingarten agreement was reached in 1909 with the town of Durlach. After the construction of two elevated tanks on the high ground north and south of the village of operation could begin a year later. 1912 were already 446 of 496 houses connected to the supply, which gradually disappeared after the unneeded old village wells from the village.